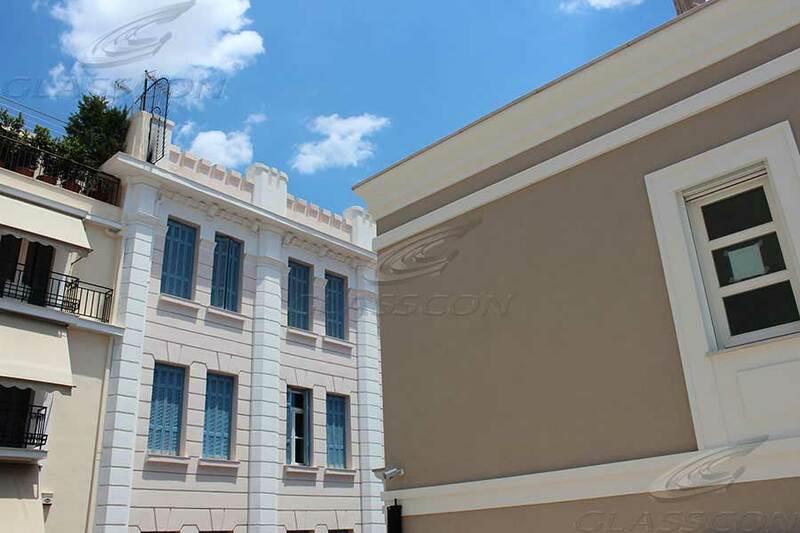 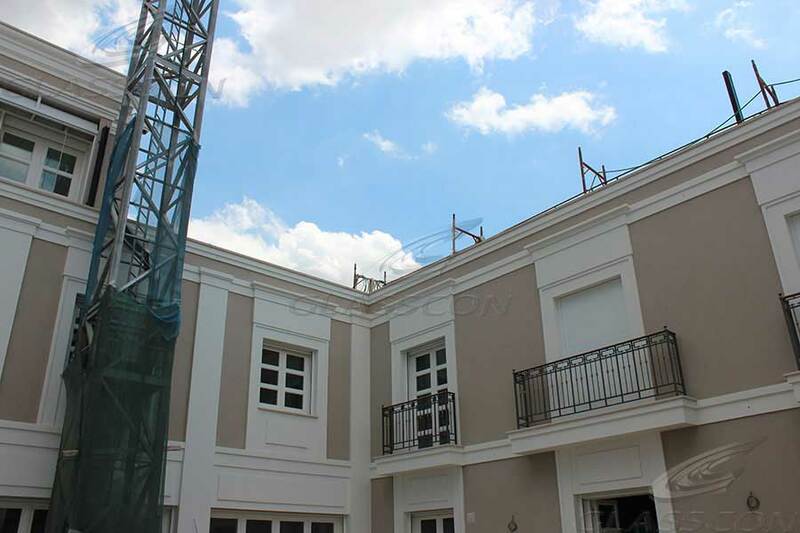 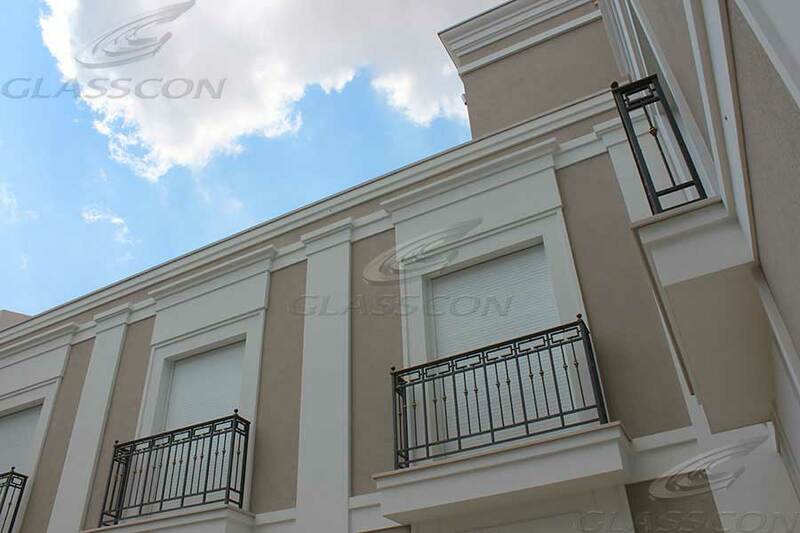 GLASSCON recently completed a newly built luxurious two storey neoclassical residence with indoor pool and central open atrium. 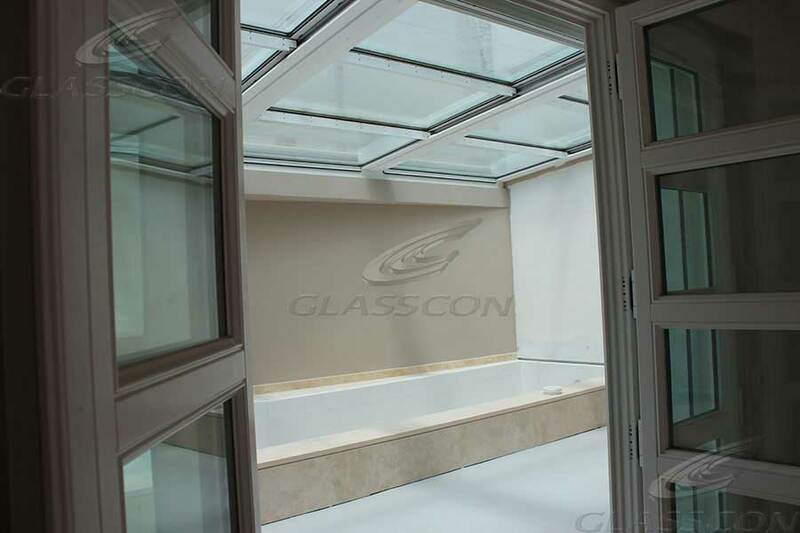 The indoor pool was covered by glasscon MOVEABLE GLASS ROOF ca 100sqm. 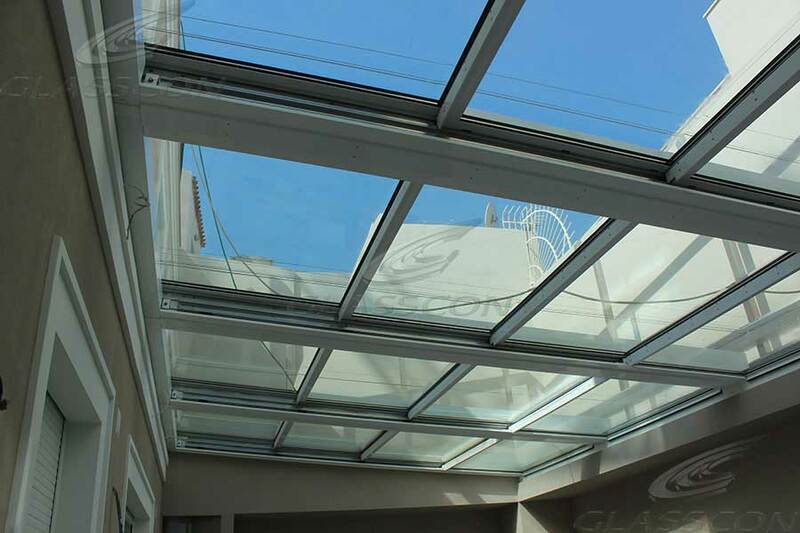 It was used an innovative LUXURUIOUS system, with electric sliding glass leaves for atriums, canopies, pools, pergolas etc. 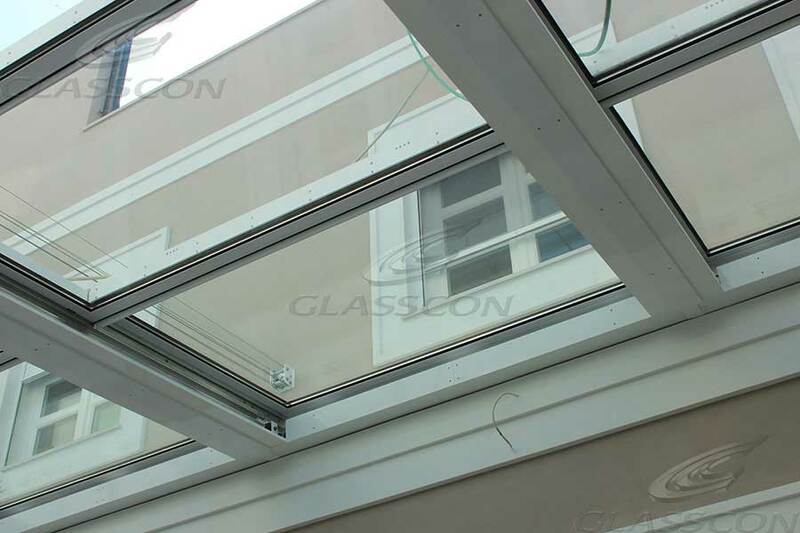 The system is absolutely waterproof and airtight. 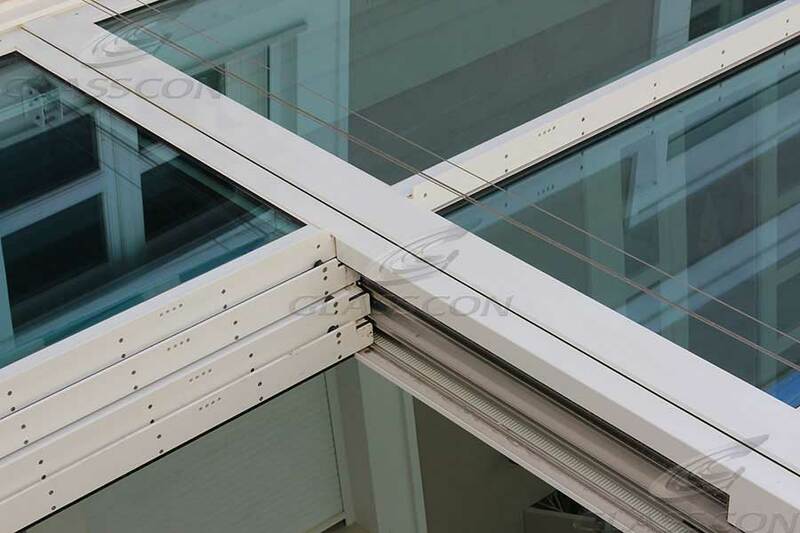 Thanks to the use of durable material as aluminum and glass the end product is an EXTREMLY ROBUST construction with high resistanse against outside weather conditions!!! 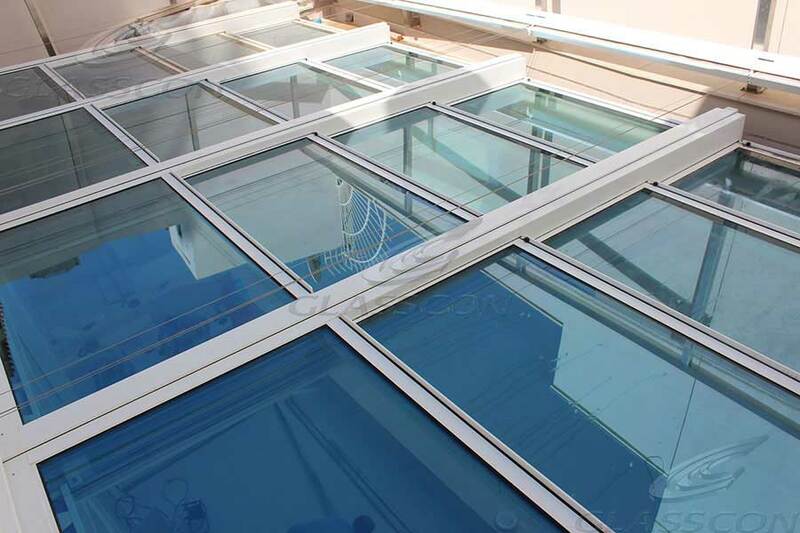 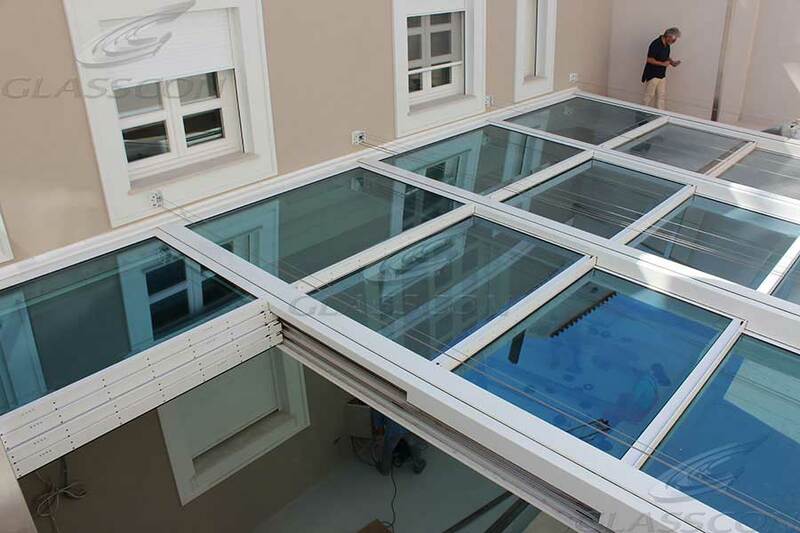 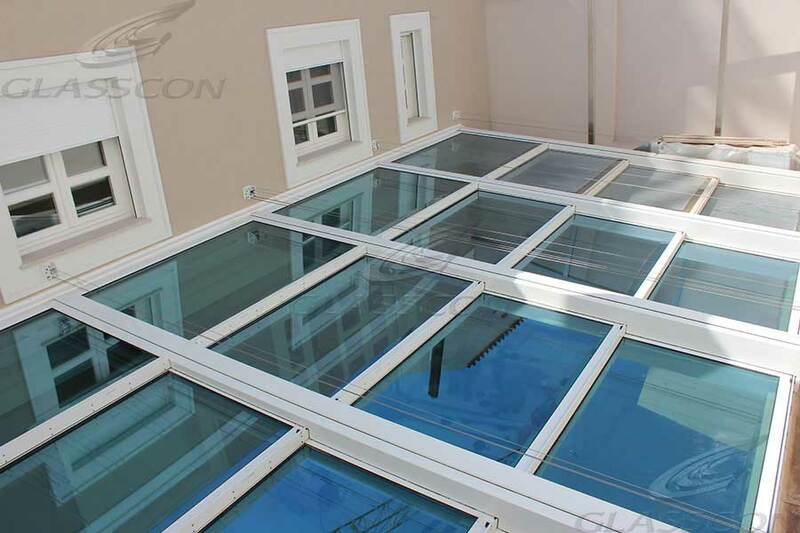 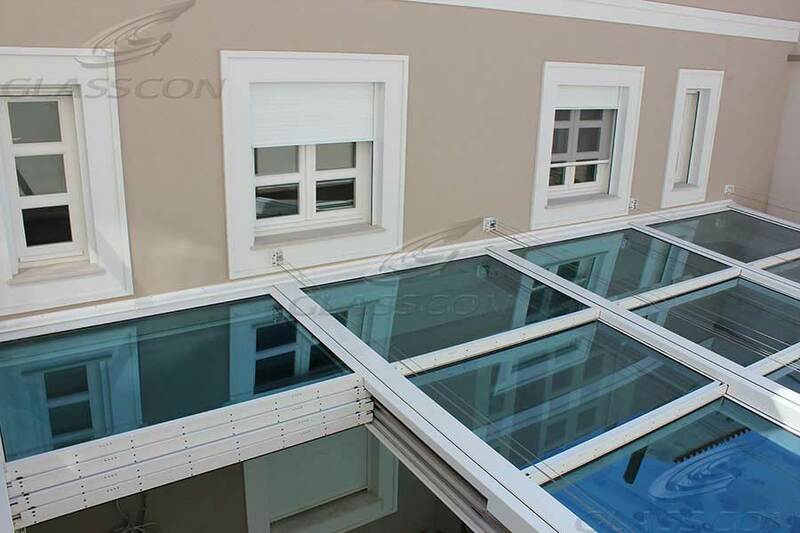 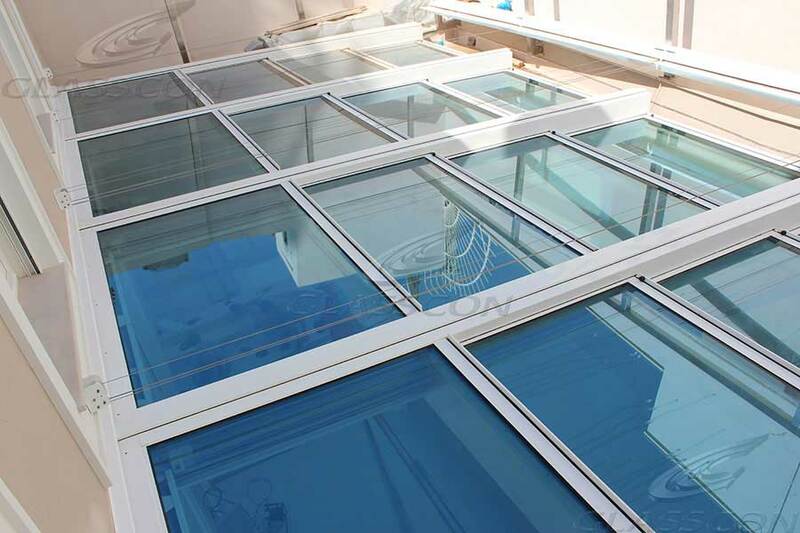 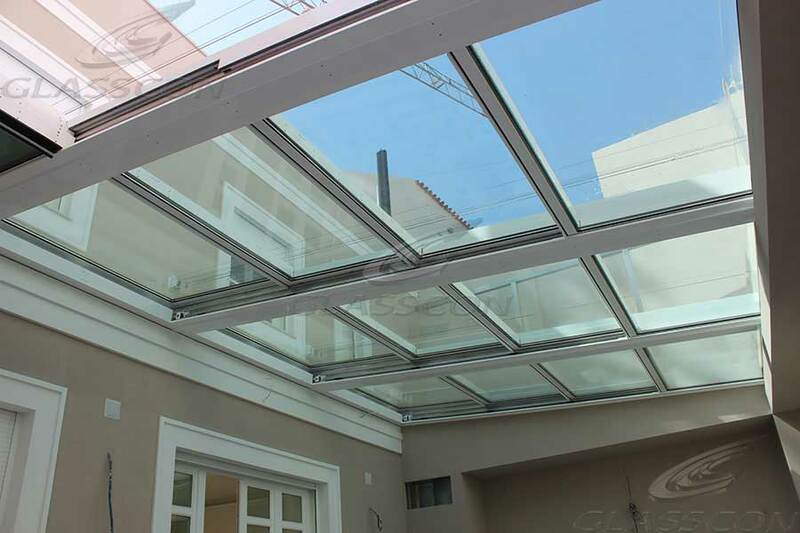 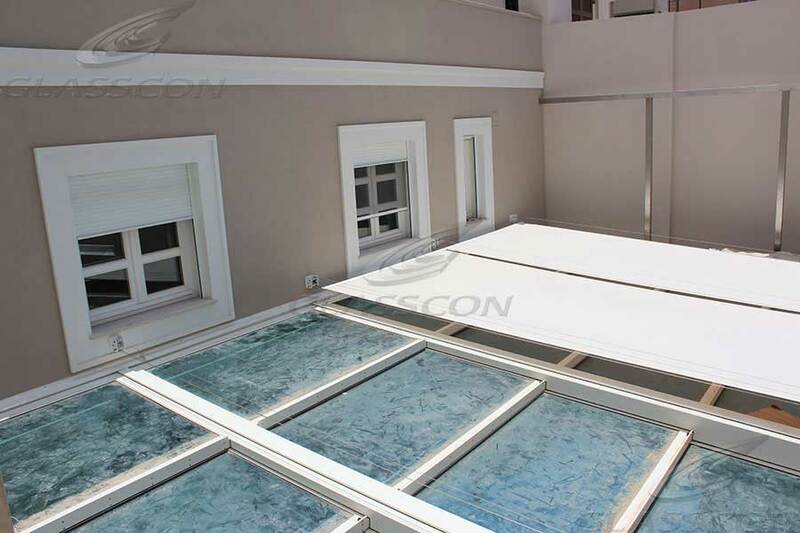 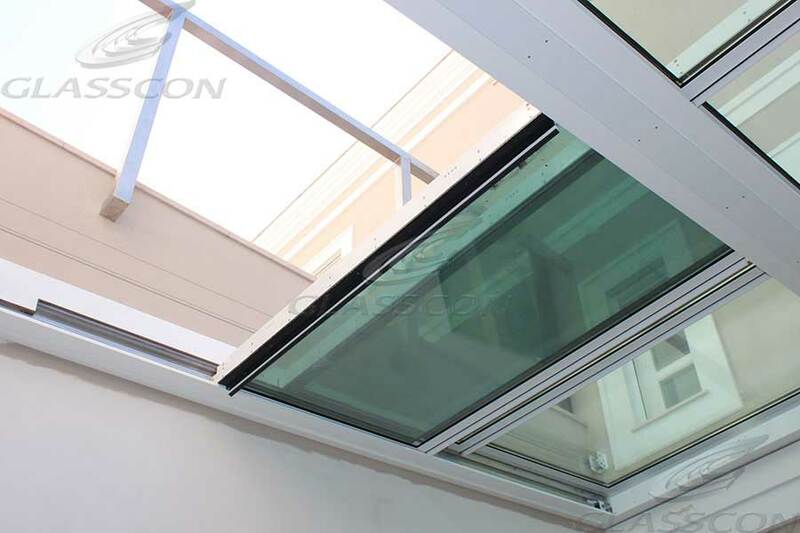 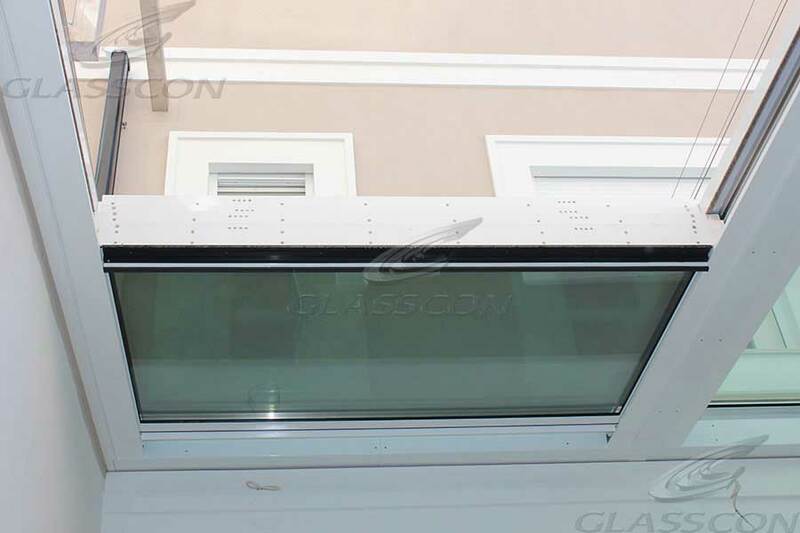 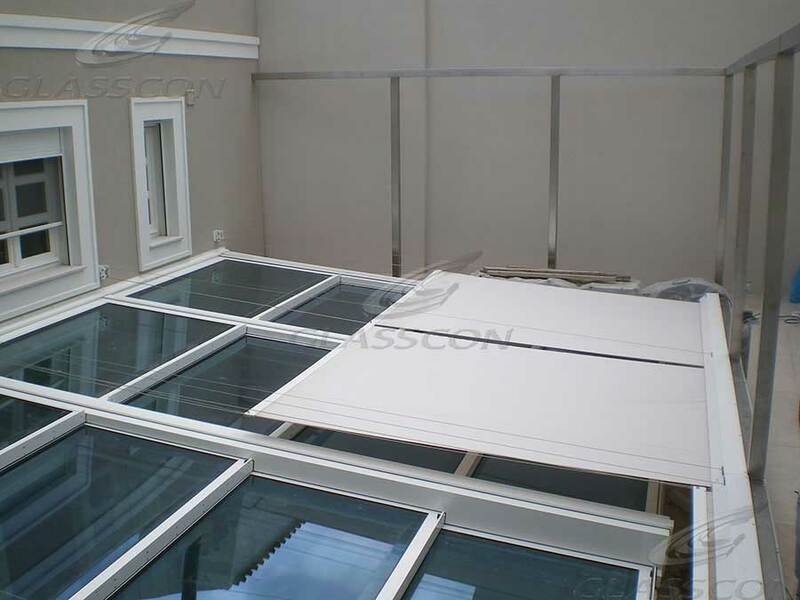 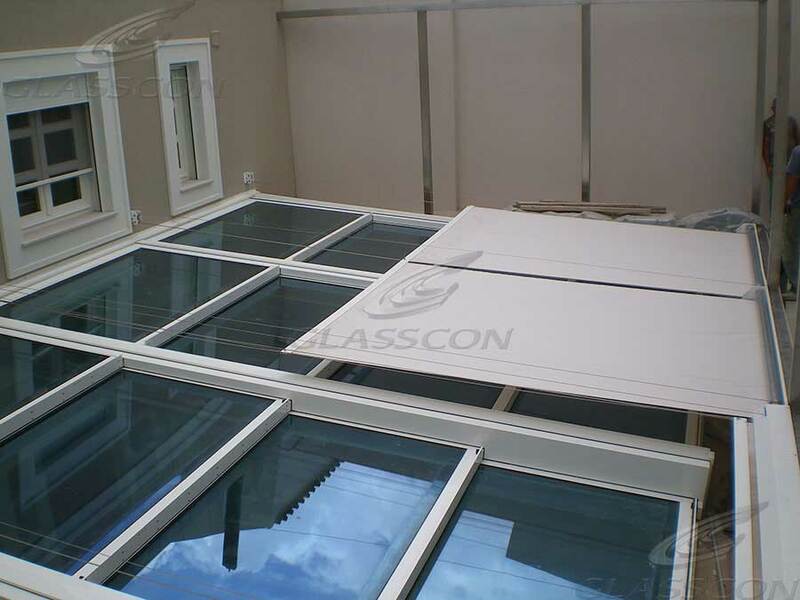 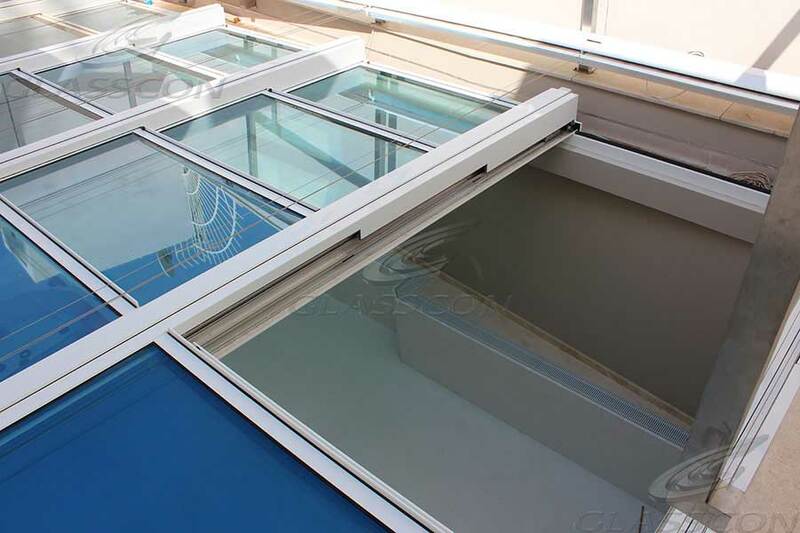 The sliding glass roof system consists of three successive safety, themal insulated glass leaves with aluminum frame. 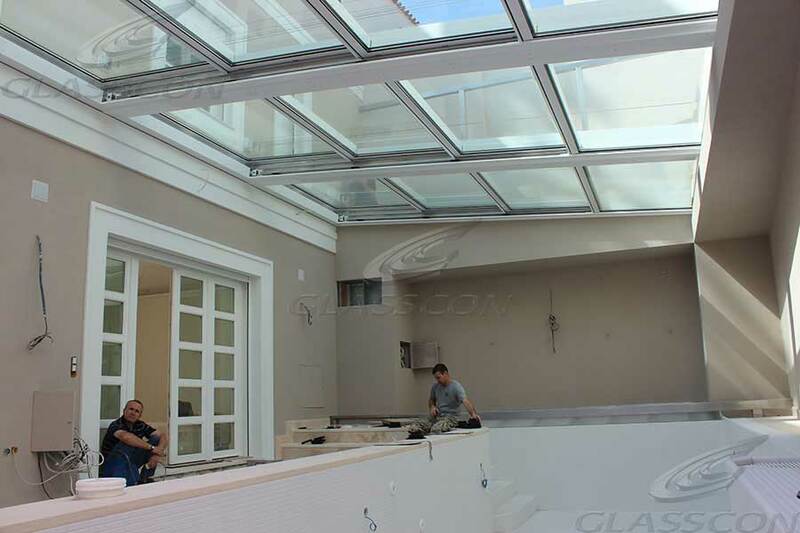 By the opening, each leaf slips below the next one in such a way that the 2/3 of the roof remains finaly uncovered. 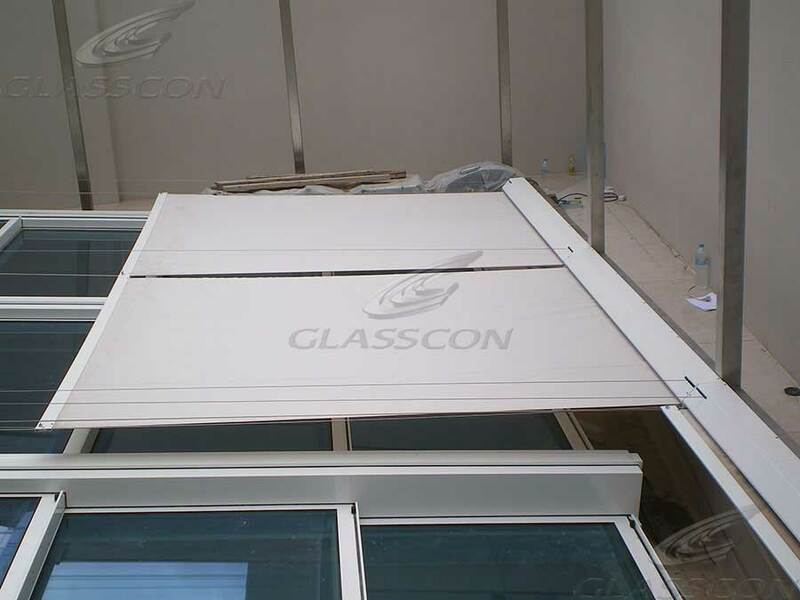 The upper leaf per collumn remains fixed and the rest slip below in the other order to uncover the roof. 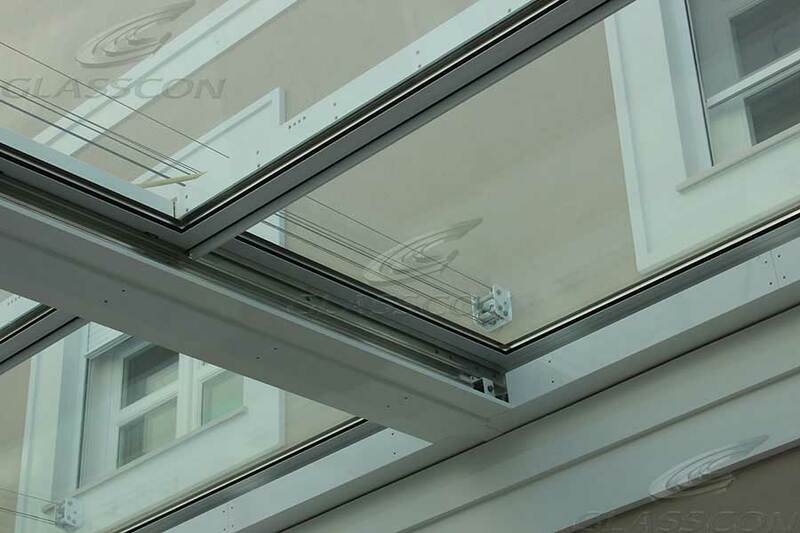 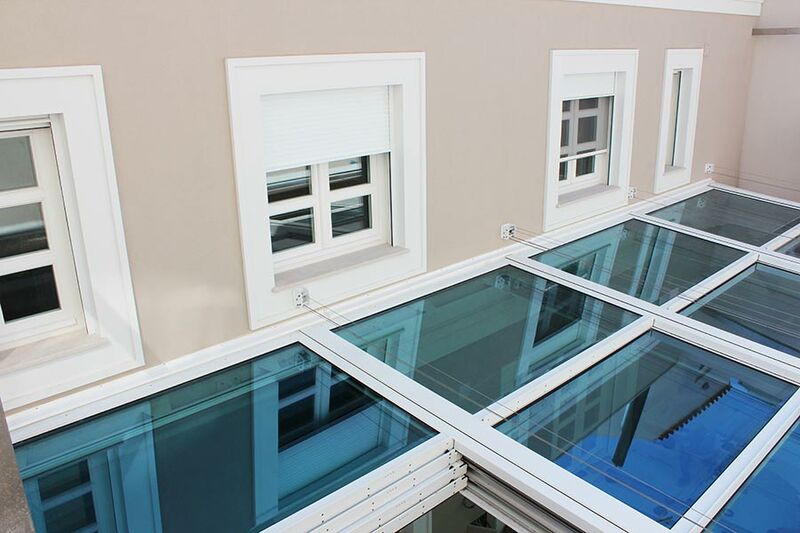 The ANTIVANDAL SAFETY, BULLET PROOF THERMAL INSULATED DGU glass panes are framed with special aluminum profiles and move automatically by an electric motor with easy, safe and quiet motion. 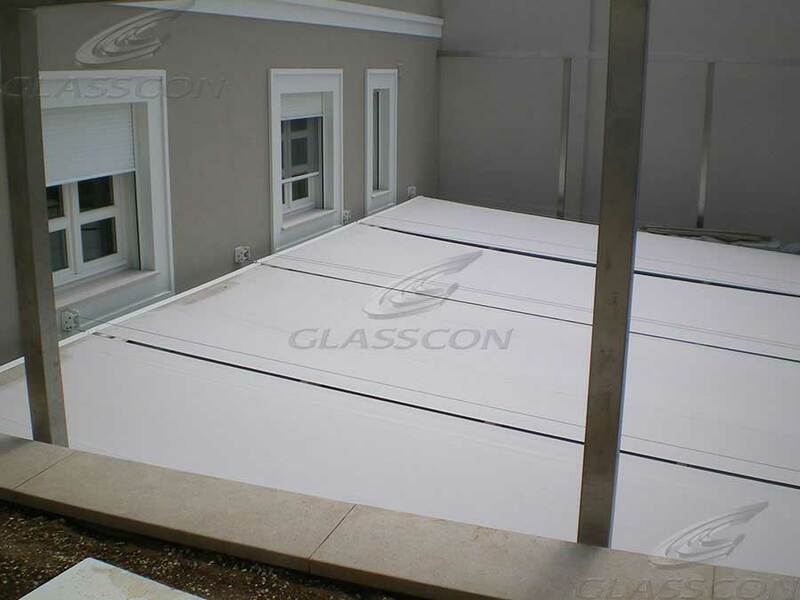 The excellent result of OVER HEAT AVOIDING is TOTALLY achieved by integrating external shading system with LARGE MOBILE TENTS. 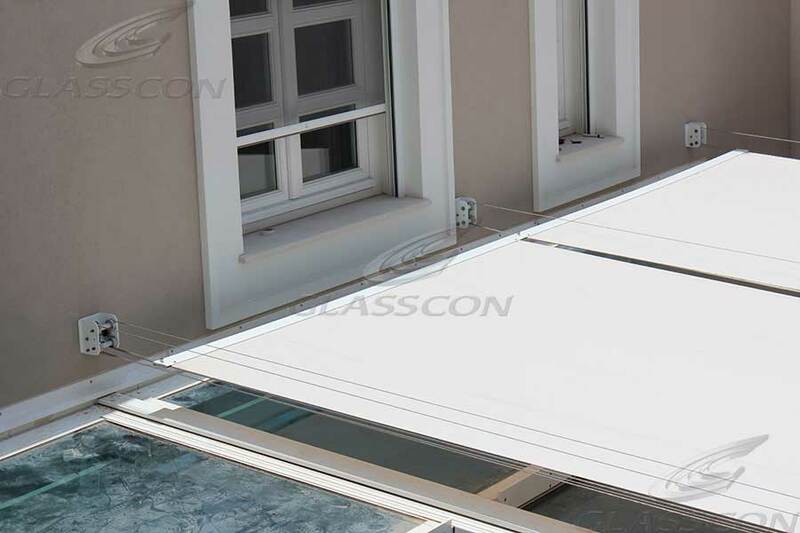 It is a MINIMAL STYLE awning system with STAINLESS STEEL ROPES ( WITH NO DRIVERS ) and small motors. 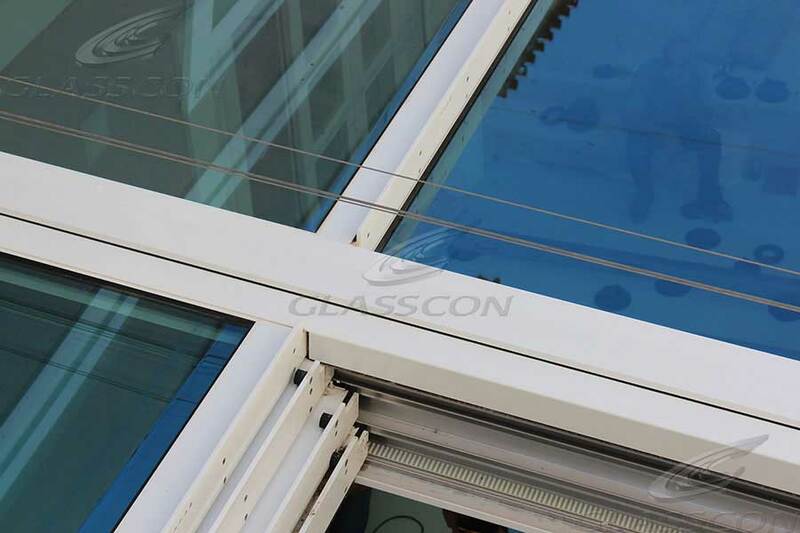 It operates with two motors and the fabric runs over specially manufactured DOUBLE CABLES, with rolling mechanism, counterweights etc. 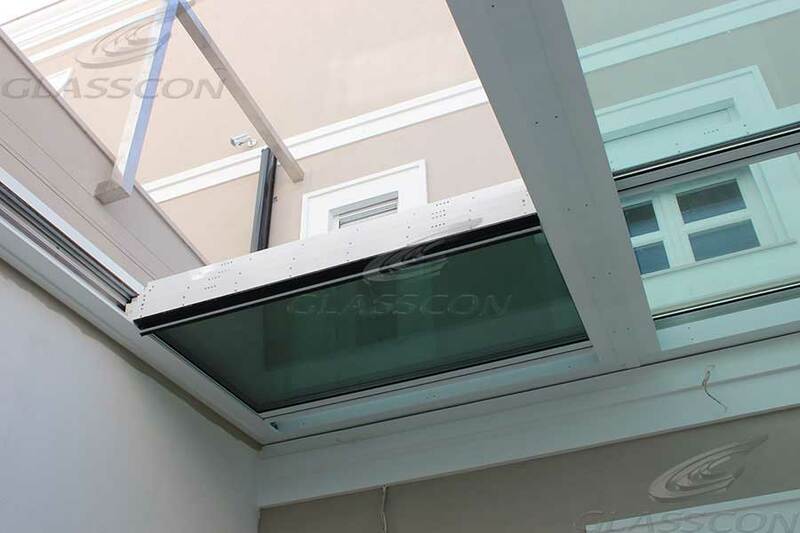 For extra security reasons, over the glass sunroof was placed a stainless steel construction with special coverage by ARCHITECTURAL STAINLESS MESH .